How do you make my 6-year-old climb walls like Spider Man? -Give him something with sodium benzoate. We found out this interesting yet annoying reaction when my oldest son had some “Sunny D” for the first time at an event. -He was about three years old. My husband and I were busy playing for the event while someone else watched our kids. When we finished playing I went to find my kids and I literally found my son hanging from the bleachers. I asked him to get down and he just stared at me with a wild and far-off look in his eye. I spent the rest of the time chasing him from one crazy dangerous act to the next all the while wondering, “Who are you and where have you put my son?!”. When I tracked down exactly what was different in his diet that day I found that it was the kid-appealing, drink-like liquid substance known as “Sunny D”. Never being one to jump to conclusions I tracked some down and gave him some a few days later. -Wild boy returned. That was enough of that. Seeing that it was my job to make sure he lived until adulthood I decided he must never ingest it again. Well, through other experiences and some experimenting I found that the specific chemical that seemed to affect him was sodium benzoate. Then I started reading labels and found it everywhere. Parenting just got more complicated…again. 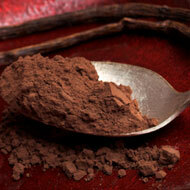 In a 2 quart sauce pan mix the cocoa and water with a wire whisk or fork. Heat the chocolate water over medium heat, stirring occasionally. Add the sugar and continue to stir until the sugar dissolves. Bring the mixture to a full rolling boil. Reduce the heat to medium low and boil for a full 3 minutes. Remove the syrup from the heat. Add the salt and vanilla, stirring to blend. Pour the syrup into a clean pint sized canning jar, or any container you would like to use. I use one I can “squirt” the syrup out of. Store it in the fridge. You can use organic, fair-trade sugar, or substitute the sugar for honey. I would use about 3/4 cup honey for each cup of sugar and then reduce the water to 3/4 cups. Also, you can buy really good cocoa powder and have a really nice finished product. One that you just may eat by the spoonful right from the fridge…not that I recommend that, (well, every once in a while). One other thing I do is substitute a vanilla bean for the the vanilla extract. I just take a bean, split it and scrape the seeds into the cocoa mix before I heat it. I throw the bean in there too. I leave it in as the mix heats and boils and then take it out before I put it in the fridge. That’s all there is to it. You can have your very own wholesome chocolate syrup for a fraction of the cost. I’m going to make some now! Amy's Story (and our farm/home) -in film!